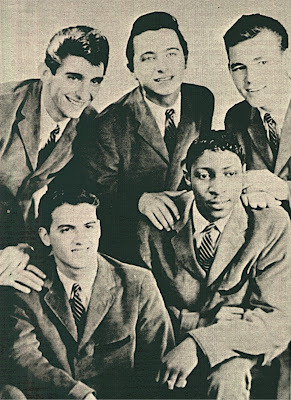 Interracial group from the Ridgewood-Bedford Stuyvessant secction of Brooklyn formed by Tony Passalaqua(Lead),Angelo La Greca(Baritone),Nick Trivatto(Tenor),Ed Wheeler(Tenor) and George Cernacek(Bass).George really was a tenor but with the help of one cigar(he smoked the cigar with the intention of deepening his voice) he sang as the bassman of the group. Their manager Jim Ferreri send the group to Capitol Records this label liked the voice of Tony and want recorded he as a solo artist but he insisted that he would not singing without the group. In the summer of 1958 the group recorded four sides and in September two were released_Chapells Bells/I Wonder Who. with only a moderate local success.six months later Capitol released the others two sides_Who Do You Think You Are/Come To Paradise. without any success the label send the group to the studio where they recorded many sides as Teenage Wedding,Recess,Love That Girl,Dear Lord.Oh Rosemarie,Fried Chicken And Macaronie. 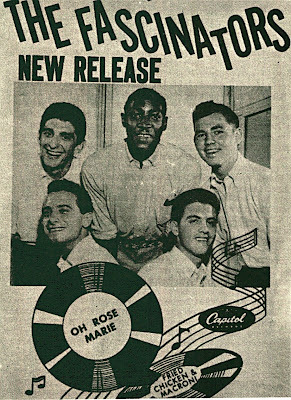 In the summer of 1959 the label released Oh Rosemarie/Fried Chicken. 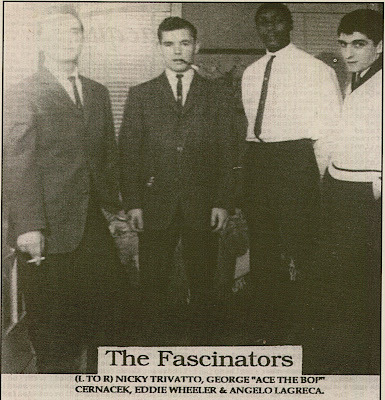 this recording made many live perfomances to the group(in the b side each member of the group sang lead in turn) but also marked the end of the Fascinator's.In March,1961 Capitol re-released the first Fascinator's single and this have a big acceptaccion. In 1972 Bim Bam Boom Records released one single with the Fascinator's demos_Oh Rose Marie/Forgive Me,My Darling(Tony 14 years old). and in 1995 Park Avenue Records released another single with the unreleased sides_Teenage Wedding/Recess.Finally in 1996 the unreleased sides_Love That Girl/Dear Lord.are available from a Doo Wop CD. Tony continue in the music bussines and with two of the original Cluster's(see in this blog) and one member of The Markel's(see in this blog) recorded in 1961 for Colpix Records the sides_Please Believe In Me/Paper Boy. as The Twlights featuring Tony Richards. 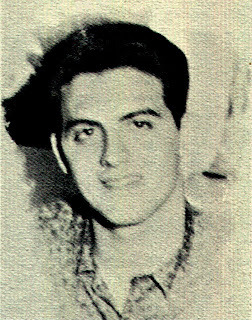 In the 60's Tony continue recording for Colpix and Carlton Records as a solo artist as Tony Richards and for Can Am and Atco Records as Tony Mitchell.